Here are the answers to the questions about functionality, configuration and management of Sigmax's HDER. 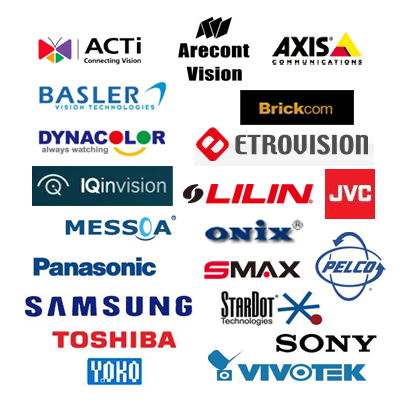 Which IP cameras are supported by Sigmax's NER/HDER? How do I install Remote Center? How do I update the HDER/NER and Remote Center Software? How do I export video archives? How do I use Instant Review? How do I set up POS exception criteria? How do I search an event using keywords? How do I maximize and minimize windows in Remote Center? How do I add a second monitor or TV to the HDER/NER (Dual Monitor Display using ATI Catalyst or Nvidia nView)? How do I connect to a HDER/NER whose IP address is a dynamic IP address? How do I reach Sigmax for technical support? Sign onto work station as the administrator. In the Control Panel window, double click display. Click the properties tab and move the Screen resolution slider to the right to indicate the proper resolution of 1024 X 768 pixels. Click OK. Load installation CD and follow on screen instructions. How do I update the HDER and Remote Center Software? On the HDER Main Control Panel screen, right click on the virtual power (exit) button. A System Information window will appear. Click on the upgrade button, and the system will receive and install the latest version of our software. In the HDER Main Control Panel window screen left click on Search. The search window will appear. Towards the bottom left corner is a calendar. Select the date of the supposed event. Then by using the time table blocks or the slide bar just below the blocks, start previewing the video for the proper time frame of the incident you are searching. The controls on the right side of the panel include regular speed view in forward and reverse, high speed review in forward and reverse and frame by frame advance in forward and reverse. At this time note the start and stop time of the incident to calculate length of video clip. Reset and pause video to start of incident. Click on Export Images button (with floppy disk symbol). The Export Images window will appear. Click on the AVI export file type then as an option you can click on Authentication Code. Click on Set Password. Enter password in proper fields and click OK.
Set the Export Length for the proper hours, minutes or seconds of the event then click on the specific media you intend to save the file on, Floppy Disk, Network Drive, Thumb Drive, etc. The Windows Save As dialog box will appear at which point you select the destination of the file. If storage on a CD-RW type disk is required then load a disk and click on the format CD button and then follow the same procedure done for the other media. Note: For CD-R it usually takes about 1 minute to format while it requires up to 30 minutes for a CD-RW to format. Therefore we recommend CD-R for common back-up. In the Main Control Panel screen of the Server, click User Admin. A dialog box with User Setup will display. Click on Add. Type in User Name, user Description and password. In the Account Usage area of the dialog box set the account for unlimited or limited (time settings). Also set the Authorized Operations for Administrative, Search, PTZ, Remote Connection, Audio. Finally, select those cameras made available to that specific user by clicking on the required numbered camera symbol at the bottom of the dialog window. Note that there is a check box to enable Auto Login (unchecked requires user to enter password to log on each time). Then click on Update. In the Main Control Panel screen of the Remote Center workstation, click User Admin. A dialog box with User Profile will display. Have the Site Name, User Name, IP/DNS Address and Router Port Number at hand. Click on Add. Type in User Name and password and click OK. Then enter in the Site Name, User Name, IP/DNS Address and Router Port Number. Note that there is a check box to enable Auto Login (unchecked requires user to enter password to log on each time). Then click on Update and OK. Assuming that the IT system administrator has enabled your workstation privileges on the server and has added a user profile on the workstation with Site Name, User Name, IP Address & Port Number, when the Remote Center software is enabled, the Control Panel will display a split screen (with either static images or no images). On the right side of the control panel will be the Site List. Left click the site you wish to view, left click to expand the device tree (showing all cameras this workstation can view). If any camera symbols indicate an X within, right click and choose show camera. Left click on site name again then click on connect button. On the Server Control Panel, click on the Event button to display event report. Expand the report chart by clicking the left arrow adjacent to the chart. Scroll through the event log to search for the specific event you want, right click on that event line and choose Instant Review from the menu. That event will play on a pop-up window on screen. When finished, close that window and click on the right arrow adjacent to the event log to minimize the event log. On the Server Control Panel click on the System Setup button. Click on the POS Interface tab to view the POS Interface Setup. Under "Exception" panel, click "Add" button to add user-input texts, which will be displayed in the Exception Color specified by "Text Color" and an alarm will be generated for the corresponding camera. To delete items in the "Exception" panel, select the corresponding checkbox and click "delete" button. Under "Exclude" panel, click "Add" button to add user-input text to the Exclude list, which prevents a line containing the text from being displayed or recorded. To delete items in the "Exclude" panel, select the corresponding checkbox and click "delete" button. How can I Search an Event using keywords? To the right of the Recording Status grid are three buttons, choose event. In the Event Log, right click on any line of the log. From the menu, choose Search. From the refreshed chart of search results left click on preferred file and use the control to play the video clip. In the Server and Workstation Control Panel split screen left click on any camera image to view a single camera (with controls remaining on screen). Right click on that camera image and it will completely fill the monitor screen. To minimize to screen with controls, right click on camera image. For split screen image, left click on that image. How do I add a second monitor or TV to the HDER (Dual Monitor Display)? Connect the monitor to the DVI or S-Video output on the video card on the HDER and reboot the unit. Click on the General setup button. In the System Setup & Maintenance section of the screen click the Advanced button. That will take you into the Window user interface. Right click anywhere on the desktop(except Icons) to bring up menu. (a) Choose ATI Catalyst Control Center to bring up the ATI display settings window. Main Monitor Only - Default setting with only primary monitor in use. Spot Monitor DFP - When a Digital Flat Panel (such as LCD) monitor is used as a spot monitor. Spot Monitor CRT - When a CRT monitor is used as a spot monitor. Clone Main CRT - When a CRT monitor is used to duplicate what the primary monitor displays. Clone Main DFP - When a Digital Flat Panel (such as LCD) monitor is used to duplicate primary monitor display. Spot Monitor (TV Only) - When a TV set is used as a spot monitor. (c) Click "OK" to quit from Catalyst Control Center and restart Windows. (a) Click on "Properties" to bring up "Display Properties" window. (b) Click on Settings tab and choose the secondary monitor from the Display drop-down list. (c) Select the checkbox "Extend my Windows desktop onto this monitor". (d) Click OK to finish setup. For HDER loaded with Nvidia nView program, refer to Nvidia Video Display Mode Setup Sheet. If a HDER/NER user does not obtain from an ISP a static public IP address, the IP address he is assigned will be changing whenever the ISP changes it, therefore it is called a dynamic IP address. It is inconvenient for a HDER/NER user to connect remotely to a HDER/NER whose IP address is a dynamic IP address, because the user needs to know the exact IP address every time he attempts to connect. The Free static hostname service provided by Sigmax Security allows HDER/NER users to alias a dynamic IP address to a static hostname in the domains we offer, thus allowing HDER/NER to be more easily accessed from various locations on the Internet by using the single static hostname. Here is How to set up a static hostname on HDER/NER. Call 713-779-8868 Monday through Friday 8:30AM - 5:30PM CST. When you call, please have the Model number and Manual in hand. These items will assist in getting the issue resolved in a quick and timely manner.